"At that time, Mr. Kohn worked together with Mr. Rabunsky here in New York. At the request of Mr. Kohn, Rabunsky had a consultation with our client's husband in 1957. Rabunsky then declared that the compensation settlement by all means had to be signed if our client wanted to receive any reimbursement at all. When confronted, Rabunsky declared that our client did not have any claim to health damages, and that the ailments she brought up with him were simply ridiculous. A possible chance of justifying a claim to health damages would exist only if a person could not move any more. Based on this advice and in view of the possibility of receiving no money at all, as Mrs. Goldberg now maintains, she signed the compensation agreement under protest. The client is prepared to make a declaration in lieu of an oath to that effect." Are you able to affirm the truth of these statements under oath? Is your husband prepared to make an additional declaration in lieu of an oath, since he was the one who had the crucial conference with Mr. Rabunsky regarding the restitution settlement. Should you be acquainted with Mr. Rabunsky's address, we urgently advise you to contact him regarding a corresponding declaration. We expect your immediate response. We are obligated to advise you that as a matter of principle the courts make strict demands regarding proof that medical reasons played a significant role in the acceptance of the restitution claim. Declarations made by the applicant in lieu of oaths are therefore generally not considered to be sufficient proof. 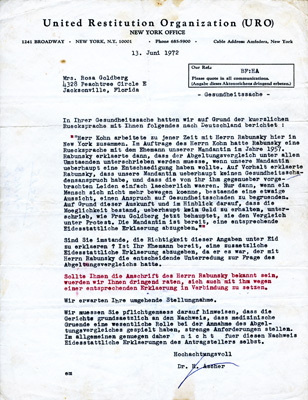 This letter from Dr. H. Ascher of the United Restitution Organization's New York office, addressed to Rosa and dated June 13, 1972, quotes a report based on a consultation with Mrs. Goldberg which the URO recently sent to Germany. The report states that a Mr. Rabunsky strongly advised her to sign a certain settlement if she wanted to receive any compensation at all, as he found her ailments to be "ridiculous." Dr. Ascher asks if Rosa is able to repeat her statements under oath and urgently advises her to obtain a statement from Mr. Rabunsky. 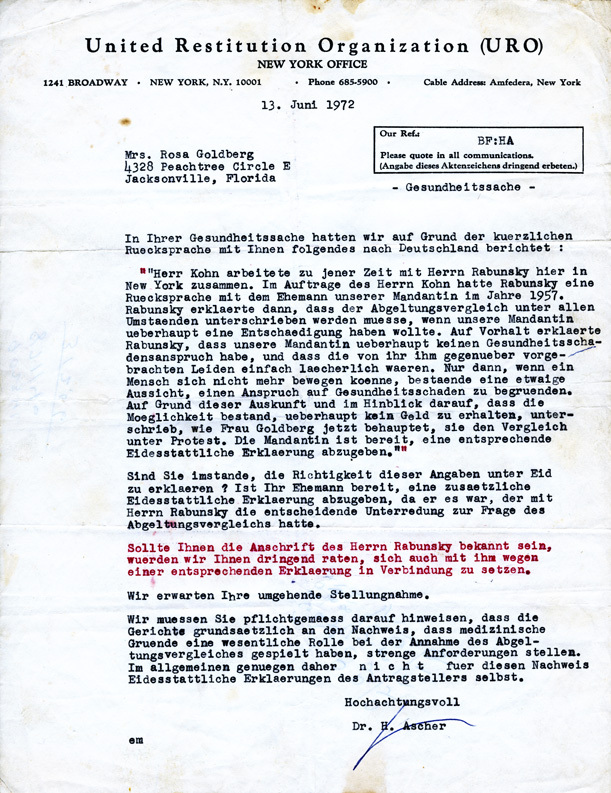 A translation of this letter is on the right.